Member’s Convention 2017 : Francois Legault announced that the CAQ will actively lend support to families who want to have more children. The leader of the Coalition Avenir Québec, François Legault, announced that a CAQ government will work to eliminate the various financial obstacles which stand in the way of Quebec families who wish to have a child. Legault declared this on Sunday during his closing address, in front of more than 600 activists and supporters who united in Sherbrooke for the annual member’s convention. The cost of raising children has become too high in Quebec, according to François Legault, who wishes to liberate mothers and fathers from the financial anxiety and burden in which they exist, after nearly 15 years of tax hikes and fee increases under the liberal party government. Additionally, the aging Quebec population leaves no doubt that there exist growing labor challenges, and Legault is highly concerned with the fact that many Quebecers are forced to give up their desires to add to their family in light of financial reasons. Over the course of the weekend, CAQ supporters adopted a series of resolutions aimed at improving the quality of life of families. During his closing discourse, the CAQ party leader announced that a CAQ government will further financially support families that wish to have children. “Continuously, family has been the center of our lives, and the heart of our society. Family is the core of the Quebec nation. Unfortunately, over the course of the passed number of years, the increase of school taxes, rates of daycares, electricity and more, have had a gravely negative impact on them. Never have our families experienced such bad debt as now. It is so distressing, that when a couple decides to have more children, they are often forced to reconsider. It is essential that these obstacles are removed for families who desire to have kids. Evidently, the primary goal is helping families. But if, in helping them, we obtain a higher birth rate, then that is in the interest of all of Quebec. It means a stronger economy!” declared François Legault. François Legault was impressed and strengthened by the vigor and the pertinence of the tens of resolutions that were debated and accepted in full during the member’s convention. With 10 months left until the general elections, the leader of the party called in his troops, who came from all over Quebec, to roll up their sleeves and embody the positive change that Quebecers need. “In the coming months, our adversaries will attack us, on all fronts, but we must not let them distract us. We have an important responsibility: that of returning hope to Quebecers, after 15 years of liberal reign. We have all that is required to enrich Quebec: creative people, entrepreneurs, excellent universities, and clean energy which we can export. Quebec can enrich our neighbours as well. We have no reason not to be ambitious. Everything is possible, we just have to think big for Quebec! 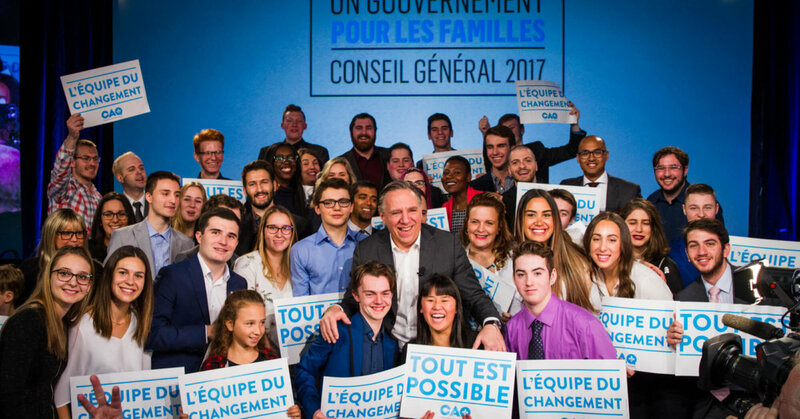 Quebecers are ready for a new team: the team of change!” concluded François Legault.